AI is a buzz in the business world. While many are talking about Artificial Intelligence methods and applications for business (including us), we notice a trend in the discussion: a heavy focus on apps. The problem is that this a narrow way of thinking about AI. That’s OK. After all, we’re only human. But AI is more than an app or a useful way to build apps. AI is a methodology. 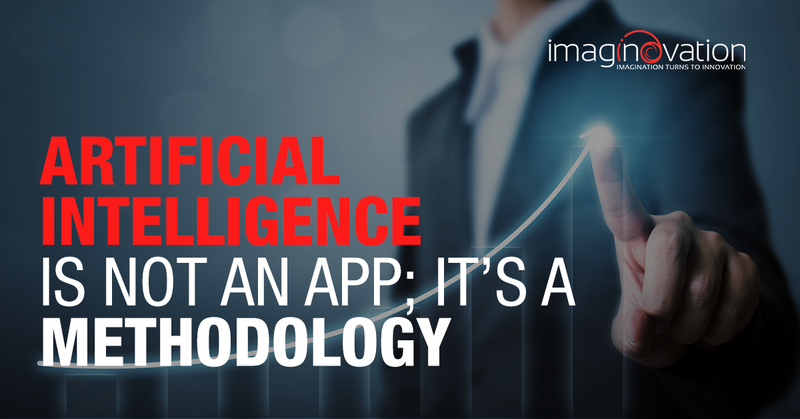 The most significant difference between apps powered by AI and any other app is the technology behind it. AI can make independent decisions based on input data. Developers create an artificial neural network, which relies on algorithms to “memorize” things and then draw conclusions and observe patterns. Building AI from scratch requires vast resources. That’s why today, AI is offered as a service. Amazon, Microsoft, and IBM all offer AI products that developers can tap into in order to power apps. This way many more people can leverage AI without building an independent neural network. These APIs offer a variety of AI features, such as machine learning and natural language processing. Machine learning software, a subset of AI, typically is trained to solve a particular problem. That has led to fewer people are working on building the basics of AI, with far more are trying to determine how best to use this technology. There are only up to 10,000 people in the world who have the skills build AI. These people command high salaries, and the market is competitive for their services among the big names. This means that as a developer builds an application, such as a chatbot, he or she is focused on using AI for an end result. But he or she does not necessarily understand the core of AI, what it is and how it works. Amazon and Google now offer consulting in addition to their AI services, as a way to retain their AI experts in-house while still helping push the field forward across industry. Facebook began “sharing” its AI experts with the telecom industries. Microsoft is marketing a suite of online courses called AI School. Amazon, too, is pushing education to become part of learning programming at the college level. In the meantime, we have limited thinking about the technology. Instead of focusing on new applications, we need first to focus on how to improve our existing applications, especially the line of business apps powering our business. Without a paradigm shift in our thinking, we may be stuck for years with the power to do far more than our imaginations can guess. After all, when humans build a neural network, we are doing so with our human capacity for creating something that “thinks” as we do. Would a machine take the same approach? Some argue AI’s methodology is far different than our approaches now to software engineering. Google is now experimenting with AI that can build other AI. At Imaginovation, we are not trying to develop new ways to accomplish AI. Instead, we are working on harnessing the existing technology pioneered by companies such as Google, Amazon, and IBM to power your applications. We leverage technologies such as chat, speech, recommendations, and intelligent search to enhance the applications already powering your company. When applying AI in business applications, user interface is an excellent place to start. Since the early days of mainframe terminals, companies have been relying on form-based software to manage everything from sales to accounting. The only difference today is the shift from a terminal to a web browser. Adding chat and/or speech interfaces to these form-based applications can improve workflow while truly modernizing the software. This is especially true for legacy systems. Via a mobile application, your team could access Enterprise Resource Planning (ERP) software through voice. The same is true for Customer Relationship Management (CRM) for sales. Your sales team out in the field can add and search customers through voice commands while (safely) driving. If finding new ways to improve your business applications and increase productivity intrigues you, talk to us about custom solutions for your company.